It has been over a month now that I am following the first ever Pakistan Gender Equality Expedition initiated by Pakistan Youth Outreach in association with a few foreign sponsors. Among others, the expedition includes two siblings from Shimshal Hunza in Gilgit-Baltistan. 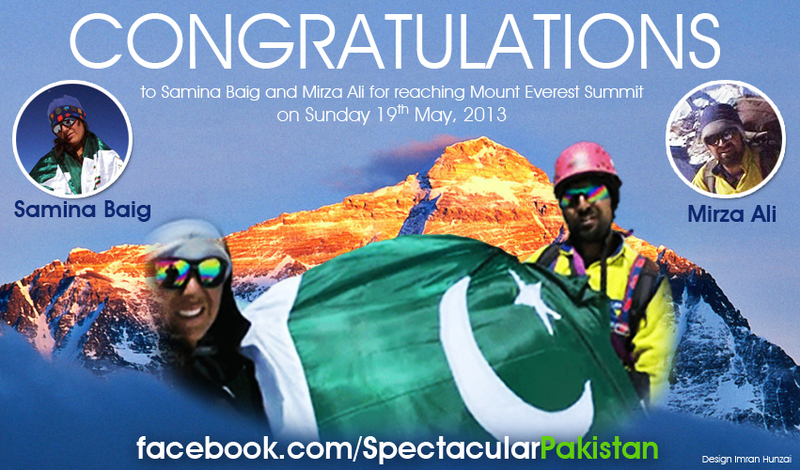 Today, I found the news on Facebook that both the siblings Samina Baig and Mirza Ali were able to successfully reach the summit of Mount Everest. This is such a huge news but unfortunately not yet covered by any mainstream media. This makes Samina Baig the youngest and only female mountaineer from Pakistan to conquer the highest mountain in the world. Also, Mirza Ali, who is a professional mountaineer, becomes youngest male mountaineer from Pakistan to reach Mount Everest Summit. Samina Baig (21) and Mirza Ali (29) set out for the expedition last month. Mirza Ali used to send messages through his satellite phone while the receiver updated his personal blog. The last time I checked his blog the team had reached camp IV and were expecting to reach the summit by 19th or 20th May. Finally at 7:40 AM Local Time they did it! Congratulations and many prayers for a safe return. I made this poster for Spectacular Pakistan.